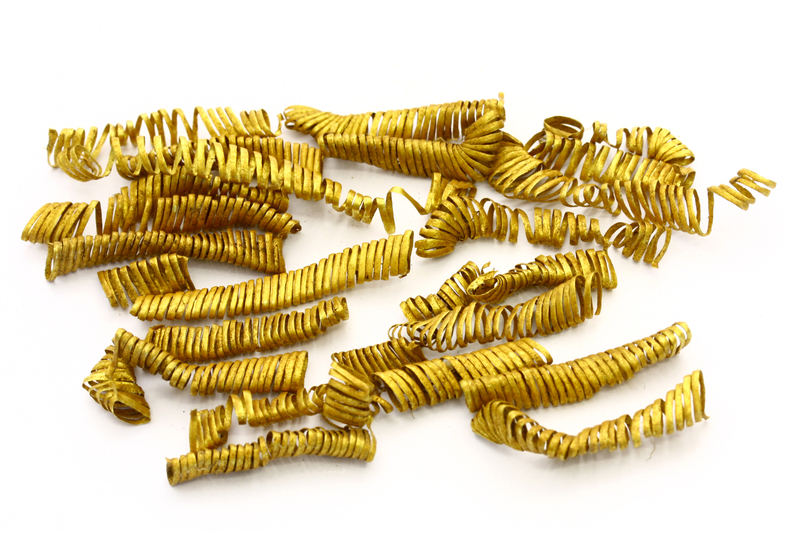 An unprecedented cache 2,000 gold spirals from the Bronze Age has been discovered in a field near the town of Boeslunde on the Danish island of Zealand. Bronze Age spirals have been found before — gold ones in the Syke hoard in Germany, for example, and bronze ones in Poland — but these are the first to be discovered in Denmark. The spirals are made of very thin, very pure, flat gold thread just 0.1 millimeter thick and up to three centimeters (1.18 inches) long. Some of the spirals are complete at up to three centimeters long; some are in small fragments. All totalled, the gold weight of the spirals is between 200 and 300 grams (7-10 ounces). 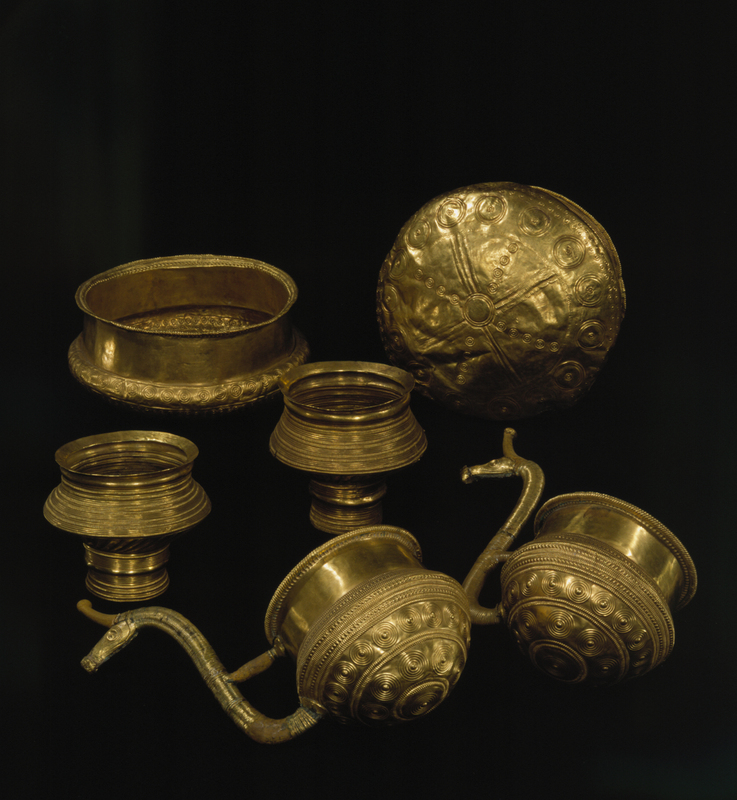 Two gilded fibulae found with the spirals date the find to 900-700 B.C. In 2013, metal detectorists Christian Albertsen and his uncle Hans Henrik Hansen found four gold bangles, so-called oath rings, in the same Boeslunde field. Six other gold oath rings had been unearthed in the field earlier (each individually at different times, not as part of a hoard) and in the 1800s local farmers found a group of six elaborately decorated gold bowls, two of which have incredibly thin gold wire wound around elongated handles crafted to look like stylized dragons. The total weight of the 10 oath rings found in Boeslunde is 3.5 kilos (7.7 pounds). The set of bowls weighs another kilo (2.2 pounds). That makes Boeslunde the richest gold field of the Northern European Bronze Age, and there may well be more to find. It was the oath ring discovery that spurred the discovery of the spirals. After the bangles were found, the West Zealand Museum undertook an excavation of the field. 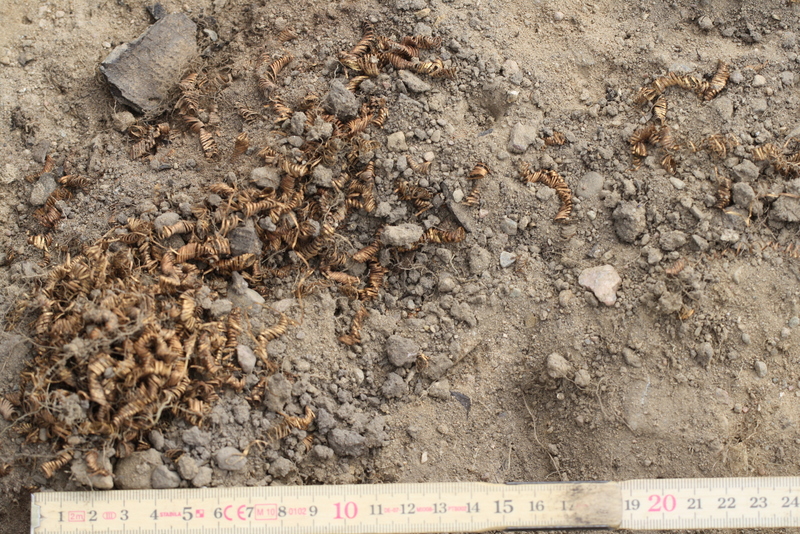 It was a small search area — only a few square meters of soil were dug up — and archaeologists found a small group of three or four spiral fragments bundled together. Christian Albertsen, the finder of the oath rings who was assisting in the dig, brought one of the spirals to a jeweler. He confirmed that it was made of gold, not brass, so the Zealand Museum decided to dig again in the same spot, this time enlisting the aid of experts from the National Museum of Denmark. 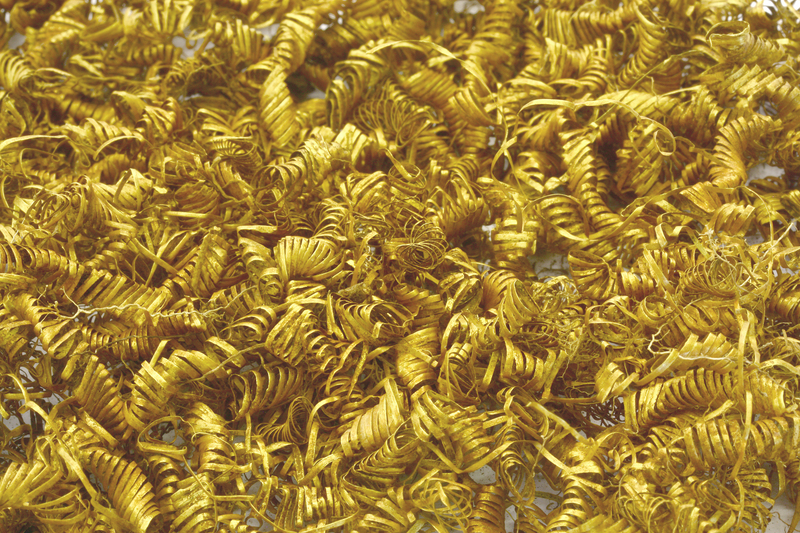 During this second excavation archaeologists made the bulk of the find: a large pile of gold coils. Underneath and around the pile were shards of a grey-black material. 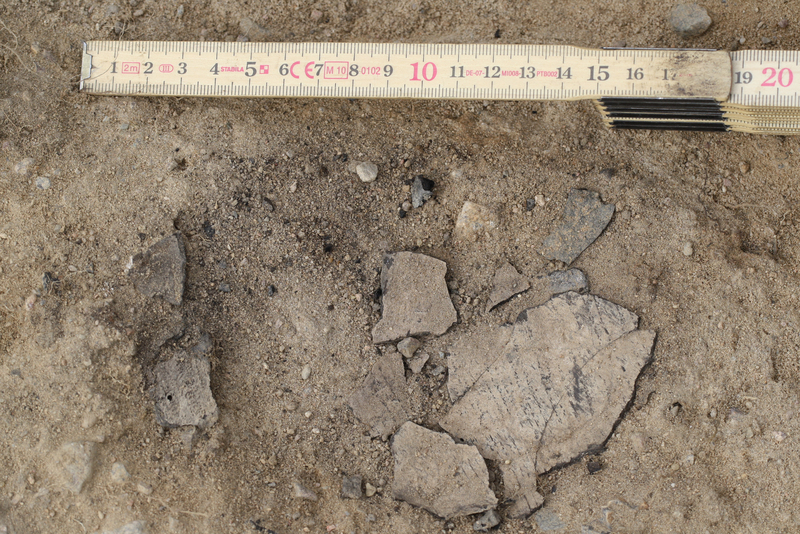 Analysis in the National Museum’s lab identified these black chunks as birch bark tar, a substance used by prehistoric peoples, including the Neanderthals, as an all-purpose adhesive starting 80,000 years ago. The copper axe found with the 5,300-year-old iceman Otzi was hafted with birch bark tar. The tar chunks found under the spirals bore the imprint of a flat wooden surface on one side of the flakes and the imprint of animal skin on the other, which indicates the tar was used to glue a leather lining into a wooden box. Archaeologists think the spirals were placed inside a jewelry box or dress chest before being buried in the Boeslunde field. It’s not clear how the coils were used or for what purpose. Given the high quantity of sacrificed gold found in the field, the location may have held ritual importance. Flemming Kaul from the National Museum also believes that the area had some sort of religious significance as a place where Bronze Age worshippers carried out rituals and sacrifices to the higher powers. “Maybe the priest king had a golden bracelet around his wrist, and the gold spirals adorned his cape or his hat, where during rituals they shone like the sun. The sun was one of the holy symbols in the Bronze Age and gold was presumably seen as having some sort of particular magic power. It is colored like the sun, it shines like the sun, and because gold lasts forever, it was also seen as containing some of the Sun’s power,” Kaul said. The Zealand Museum and the National Museum plan to continue to excavate the site in cooperation with amateur archaeologists/metal detectorists like Christian Albertsen who has been so instrumental in the momentous discoveries made in Boeslunde. The gold spirals will be on display at an open house at the Skaelskor City Museum on Wednesday, July 15th. Visitors will be able to enjoy the shiny pretty things and hear curator Kirsten Christensen speak about their discovery. This entry was posted on Friday, July 10th, 2015 at 11:47 AM	and is filed under Ancient, Museums, Treasures. You can follow any responses to this entry through the RSS 2.0 feed. You can skip to the end and leave a response. Pinging is currently not allowed. So interesting! It’s amazing how many ancient treasures are found all over the world…think of all the incredible finds there are still out there. Those ‘Proto-Celtic’ golden Bronze Age finds seem to feature remarkable similarities all over Europe: Apparently, there are bowls, wire and golden hats – Bowls from Denmark, some more info, a similar hoard, another one, bowls, a ‘hat’, another one, this one, another one and finally this one. I wonder if these may not have been an ancient embroiderers stock in trade. 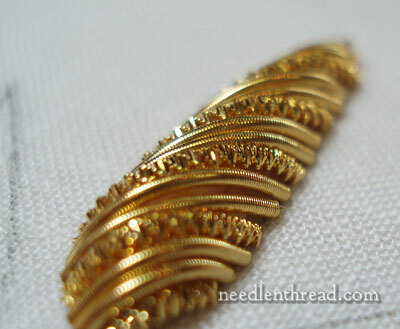 Very similar metal spirals are used today in ‘gold work’ or ‘bullion embroidery’. Seen mostly in ecclesiastical, ceremonial and haute couture embroideries. The above example is a very loose spiral close to this Danish find. However modern Purls are usually much more even and closely turned, below is an example of gold pearls worked on a simple design using two different types of gold spiral purls (smooth and check). It was also common for the gold to be recycled from old garments, cut off, collected and reused on other embroideries, in deed many pieces of embroidery were destroyed for their gold content. Perhaps as these pieces are so small they were ‘rescued’ and stored for re-use. “Strange polymer disks discovered with fragments of microthin metallic coatings that likely once covered the entire disk at one time. Under investigation the coatings were discovered to have patterns of etched markings in a spiraling pattern. Likely the disks were used in some religious ceremony and were valued as shiny objects of highly skilled artistry to honor the gods. At one time the disks ere common, but after only about three decades of manufacture (this over a thousand years ago from today in 3015) they were not seen to be made anymore. Thank you Ambrosius for thinking “inside” of the box and coming up with what is more likely the answer than the silly scientists involved. I have similar coils of pure gold on my desk. I use them for gold inlay in silver belt buckles. Many engravers use them for decorating guns. As a child I frequently coiled colored electrical wire around screw drivers and various objects in our garage to use in art projects. These gold coils look like the coils I pulled off flat stock. The in situ order could indicate the gold was coiled around an organic material that was not preserved in the site. These coils could have adorned something and remind me of a beaded necklace without the string in the way you find the beads arranged in archaeological sites. Just a thought. I think it was possibly a hair decoration, you can spiral hair into those things and 2000 of them would be very spectacular for a of sun worshiping ceremony. Thought along These lines too…only I imagined it could have been a golden wig. I mean several golden hats have been found from that era, why not make yourself some “Gold hair” to wear at those shiny sun ceremonies to stand out of the crowd and put them old agey hat wearing morons (“Look! My gold hat is higher than yours!”) in their place. I should add that engravers who do gold inlay wrap the gold wire around folded paper in lengths similar to these. It makes them manageable for the task.The pure gold is very soft and inlays well into swords etc. Mystery solved: These are “chips” from metal lathe cutting. They had lathes back then and gold is soft. They were probably left over from turning gold goblets on a wood lathe…probably powered by foot treadle. They could have possibly been stolen and buried by robbers who needed to wait before going to a smelter who would have had heard reports of the theft. Or possibly hidden, as one person above indicated, in haste when an invading force came through to pillage. My husband is a machinist and we both believe these look very much like metal shavings from machining metal, possibly even on a lathe. Totally agree with Ms.coutee’s machining comment. Shavings from machining was the first thing I thought they looked like when I saw the article on smithsonian. Question is how could such shavings be made and by what machine, if they were made in antiquity? 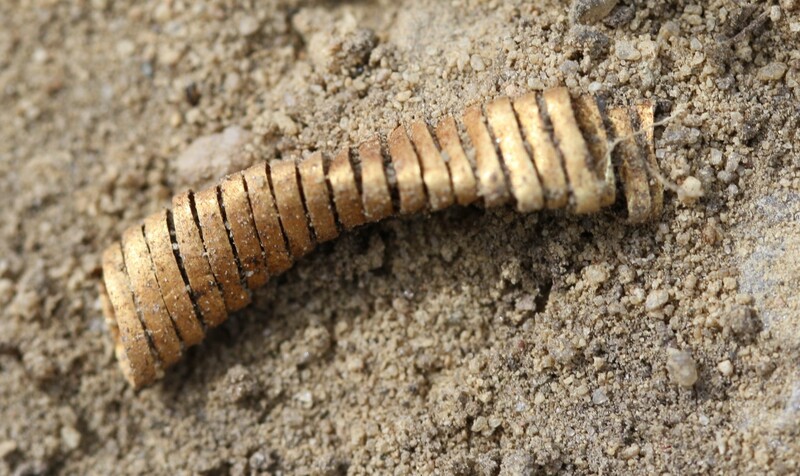 While the shape is resembling machine shavings or milling spans, the article mentioned the gold was hammered into the thread like shape and then coiled up. I think they found markings on the gold resembling hammering and not the scratches associated with shaving that go along the entire length of the thread. I think they could still be shavings that were salvaged and used for adornments or decorations and carved later. They definitely look like lathe shavings. That would explain the “pile” of them. A water wheel would be a perfect “motor” for such a lathe . . . I wonder if there was a water source near by? They look like turnings from a simple lathe making gold chalices or bowls. Of course they would be saved and given to friends. Good guess! When I pasted “Skæl skør” into Google Translate it said “dandruff crazy”. So you can see a bunch of blond Danes traipsing around in golden-wigged drag. And the location of Skælskør is between a lake and the sea, suggesting there was a mill there that turned a lathe. Pretty intriguing!